Yesterday, the U.S-Japan Program Review Committee met at Fermilab to review the US-Japanese High-Energy Physics Agreement and and recommend whether it should be continued. In 1979 the Japanese Ministry of Education and the U.S. Department of Energy signed the agreement to cooperate in planning high-energy physics. Every five years since then, a Japanese panel has surveyed the three major participating US labs: Fermilab, Brookhaven, and SLAC. The reviewers were at Brookhaven on Tuesday and will visit SLAC on Friday. The reviewers met with Director Michael Witherell in the morning, then attended presentations on collaborating activities between Fermilab and Japan, including CDF, DONUT, KTEV, R&D for high intensity proton accelerators, and R&D for the muon source. Finally, they toured several of the facilities. One member commented, "It's very important for the U.S. and Japan to cooperate so we can help promote high-energy physics." He hopes, and expects, that the collaboration will continue "to infinity." Fermilab employees try to stay warm during the fire drill on Monday. Wilson Hall building manager Steve Whiteaker reports that the Wilson Hall fire drill of Monday, October 27 was a success despite the chilly weather. Whiteaker explains that these exercises are effective training tools for emergency wardens and tenants in Wilson Hall to ensure a safe exit from the building in the event of a fire. The drills also provide an opportunity to test the various fire alarm systems. "We couldn't have asked for better results from the fire alarm systems, employees, and emergency wardens," Whiteaker said. "The fire drill's success is a direct reflection on the cooperation of all who participated." [WASHINGTON] Physicists are shooting for the stars in a bid to understand the mysteries of dark energy � the enigmatic force behind the Universe's accelerating expansion. In a ground-breaking collaboration, the US Department of Energy (DOE) has teamed up with NASA to plan a series of launches that will explore this exotic area of astrophysics. Supersymmetry, an attempt to unify the description of the elementary particles and forces, predicts a new "superpartner" for each known particle. Neutralinos and charginos would be partners to the W and Z particles, which are carriers of the weak force. The lightest SUSY particle (LSP) is a promising candidate for the mysterious dark matter that pervades the universe-an appealing connection between the microscopic universe and the immense distances of astrophysics. 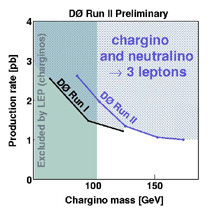 The DZero collaboration has used Tevatron Run II data to search for events containing charginos and neutralinos, particles predicted in supersymmetry theory. SUSY particles can be produced in pairs in proton-antiproton collisions at the Tevatron if they are not too heavy. 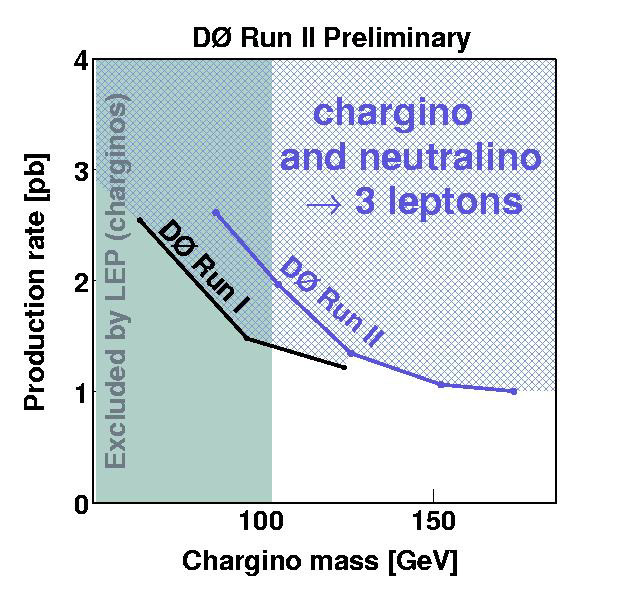 The production of a neutralino with a chargino can be observed by their decay into three electrons or muons and the lightest SUSY particle (LSP). Large missing energy in the detector is a signature of the latter. No significant excess of such events has yet been observed. DZero will continue to investigate this channel with the new data coming in, and expects to be able to probe new SUSY territory up to chargino masses of 200 GeV. Ulla Blumenschein (left), of Freiburg University, Germany, works on SUSY searches. Drew Alton (right), of University of Michigan, works on the Fiber Tracker and Central Preshower. Free Flu Shots are Still Available! Free flu shots are still available. You must be an active, full-time regular employee. If interested, please contact the Medical Office at x3232 to schedule an appointment. The GSA committee cordially invites you to the GSA's annual Halloween Party on October 31 from 8:00 p.m. to midnight in the Kuhn Barn. It's time to dust off those witches' hats and broomsticks and get down to the Barn for free drink, food and fun. Fancy dress encouraged! A Presentation on both the Costa Rica and New Orleans trips will be on November 5 at Noon in WH1W. Brochures are available in the Recreation Office.